Parapluie is a prototype bus stop shelter canopy that was developed in cooperation between schneider + schumacher architects and the construction company Ducon. The canopy is an exposed concrete shell, developed for mass production using a milled formwork that can be reused multiple times. 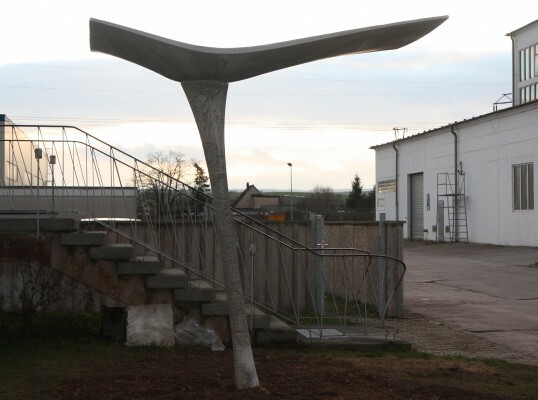 Parapluie is based on the idea of building a seemingly ultra light concrete canopy consisting of only two single elements – a column and a shell. The curved shell, 2.85 m long by 1.70 m wide, offers shelter for up to 12 people. The illusion of lightness is created by the minimal use of material for the precast shell, which tapers to a thickness of 24 mm at the perimeter edge. The shell, raised 2.90 m off the ground, is eccentrically supported by a sloped, cone-shaped column. In addition to acting as a support for the shell, the column is also used for drainage. The asymmetrical 3d geometry was deliberately chosen and designed and optimised using parametric design technologies. The structure of the shell was generated based on the concept of a sheet of paper folded between fingers ensuring a load transfer of the shell mostly by membrane effects. 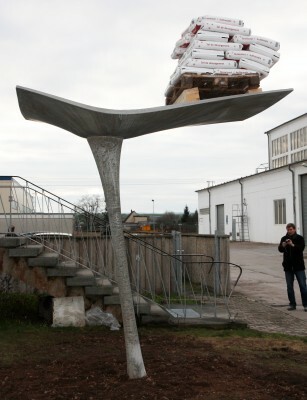 The result is a concrete shell with no steel embedded items and an edge thickness of less than 24 mm. The folding also helps to prevent the thin concrete shell from failing.